One association’s website gets heavy traffic. Its members keep the site in their bookmark bars because, for them, the website is the association. Another association’s website gets little traffic. What’s the difference? It’s not the size of their budgets; it’s the level of the association’s IT maturity that makes the difference. 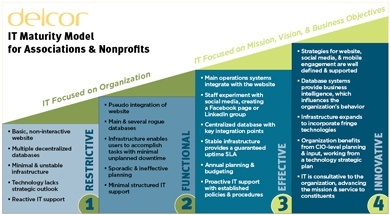 The IT Maturity Model is a benchmark we developed to measure how effectively an association’s data and technology management, network infrastructure, and use of digital platforms work together to support its mission and business objectives. This strategic, integrated approach recognizes that no piece of technology works in isolation. For example, the success of a website redesign and content management system (CMS) implementation depends on far more than the vendor and product you select. Many other factors affect how well a new website will meet its goals. Can the network support increased website traffic? Who is responsible for keeping the website up and running smoothly, troubleshooting when necessary, and introducing new features to better serve members? Will the website integrate with the association management system (AMS), learning management system (LMS), and other systems? Do business processes support an efficient content workflow? Does staff have the appropriate training to create, manage, optimize, and publish written content, podcasts, photos, and videos? Does the organizational culture support collaboration? Does the association have a member-centric, nimble, publishing culture? Does the association have a content strategy? Who will manage the website as an editor-in-chief? Are sufficient staff resources available in all appropriate departments? A website’s success is dependent on how well the organization’s culture, processes, and technology work together. Let’s take a closer look at what a website looks like in the four phases of IT maturity. While your members are fully immersed in the 21st century, your website is still back in the 20th century. Website traffic is sparse because, after years of having mediocre or frustrating experiences, members have low expectations. Website navigation is based on departments (eek!). The search function brings up many irrelevant results or is flat-out broken. Content changes are a hassle for staff because they have to go through the webmaster who takes forever to get things posted (which may not even be his fault, if he’s tasked with other irrelevant duties or there’s no orderly process). The site is stale. The website (and the association’s reputation) is suffering but no one realizes it because no one monitors analytics and member feedback is unsolicited. The website is seen solely as a responsibility of the stretched-thin IT (or marketing or membership or communications) department. Members and staff alike complain about the lack of a members-only section and online registration, but nothing changes – there’s no money in the budget. A functional organization has a decent website, but it’s one step shy of integration and automation. The site shows up on mobile phones, but users have to zoom, pinch, and scroll their way around. Consequently, mobile traffic is low so the association is under the mistaken impression that members don’t need a mobile-friendly site. Because the website and AMS aren’t integrated, staff regularly uploads files to authorize member access, but they still get calls from members who can’t log in. Members can register for meetings online, but the data has to be exported from one system to another. Webinars, educational content, and certification courses may be delivered through a variety of unconnected platforms. Staff can make updates to the website but it’s a piecemeal effort. There’s no content strategy, collaboration, or editorial guidelines. In the effective phase of IT maturity, technology is doing what it’s supposed to do in a predictable, efficient manner. The website supports the association’s mission by helping it achieve goals, like providing news updates and online courses. The website adds value to the membership experience, for example, by hosting an online community where members can share advice and solve problems with their peers. The site is integrated with the AMS, LMS, online community, and event registration system. Members sign in with one username and password to access their member profile, renew membership, attend online courses, or participate in the online community. The website is member-centric with intuitive navigation and an effective search function. Twice a year, website usability testing shows how to further improve the visitor’s experience. Association leadership understands that the website is the association for most members. A website editor-in-chief works with a team of content creators from across the association. A content strategy helps facilitate the creation, distribution, and management of content. Staff receives the training they need to use the CMS effectively and to create all types of content – video, audio, and text. Online content is always fresh and relevant. In this most progressive phase of IT maturity, there’s a plan in place for keeping the website – the content, technology, and strategy – current with members’ expectations and needs. Data from website analytics is used to identify future opportunities. The association can quickly adjust content and program calendars in response to emerging needs. With their phone or tablet, members read the latest news and watch conference videos. The mobile app is integrated with other systems so members can use their phone to register for webinars, find contact information for fellow members, and participate in online community discussions. The website is personalized. When members visit, they see the news, events, education, online community discussions, and products that are relevant to their interests, needs, participation level, region, specialty, and career stage. Members can self-select areas of interest and update their profiles – all of which gets communicated across systems, eliminating duplicate entries or effort. Although this post focuses on websites, the IT Maturity Model applies to all aspects of technology – strategy, management, infrastructure, data, and digital platforms. When people, processes, and technology are connected and considered as a whole, technology is more than a tool; it’s a mission-enabler.